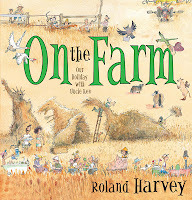 Author and illustrator Roland Harvey has released another hilarious book in his illustrated holiday adventure series. For those who haven't seen the books they are quirky, funny and very Australian. 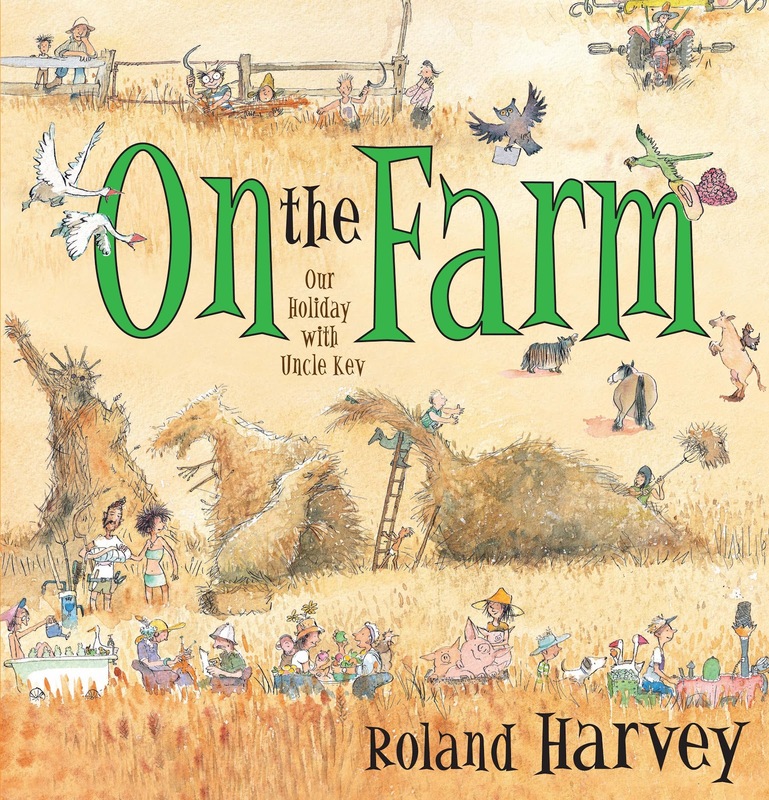 Previous titles include At the Beach, In the City and In the Bush, and you could easily spent hours just discovering all the little stories included in the illustrations. Roland was kind enough to answer some of my questions about his new book and how he works. 1) Your "At the ..." series has a very Australian feel (and sense of humour). Is that something that is important to you? THE most important thing. I dearly love the Australian landscape and hope that people learn to "see" it in all its' subtlety, from the smallest flower to the patterns of the vast inland; its' colours and textures and the amazing flora and fauna we have which is quite different to anywhere else. I want to see it understood, appreciated and preserved. The humour is just me really, noticing ridiculous things and playing with words and shapes. I notice odd-shaped people and odd-shaped attitudes. 2) Do you sometimes find yourself laughing out loud when you are writing and illustrating your books? When a good idea hits, maybe. Or a totally unplanned joke jumps out at me. Or a really nice double meaning or word- play. Unless it's a goat, of course. But to ride it it should be a horse." "Coincidental: When two people have exactly the same teeth." 3) Which comes first for you - the illustrations or the text? It can happen either way. Sometimes I'll be mucking up a picture, so I'll sit down and write a bit of text and then do a different picture. The result will be quite different. My brain surprises me all the time, but it is also capable of locking me down. Often ideas for other books come as I'm working on an illustration. 4) Many of your illustrations are very detailed. Do they take you a long time to draw? Not if I am familiar with the subject. I love inventing places. Often as the place takes shape, I discover things I didn't intend to do, and characters just come out of doorways and I watch them with great fascination. It is very easy to disappear into an illustration and start re-writing the story without realising it. That's probably why you are likely to see things in a picture that make no sense at all. It is a very different matter if I have to research a subject, as I think I am a bit obsessed with accuracy in a funny sort of way. Eg. the illustration for 'Thomas, World's Sickest Man" (Sick As, The history of Medicine; Dr. Gael Jennings) took less than an hour, but the research took six weeks. The river camping page in "In the Bush" is very detailed but I am familiar with the place and it only too a day or so to do the pic. Of course there is a lot of physical work in colouring, but once I get going I am pretty fast. Don't look too closely, though. It also slows down when I have to draw a place from a different angle and it has to look like the same place. I have to draw a map. My worst nightmare is trying to draw something/somewhere that I haven't actually seen, like some of the illos in "All the Way to W.A. 5) Tell us about your Uncle Kev. Uncle Kev is a sort of amalgam of two of my dear friends, and me. The real Kev is my brother-in-law, who is very capable and built his own mudbrick house and restored (beautifully) the Jaguar XK140 in the shed picture. He used to take adventure safaris through Africa in the '70s. He looks a bit like my Kev. He will be at the launch, and I will twist his arm to bring the Jag. The other one is my mate 'Bucko', who grew up in Kenya as the son of a genuine old fashioned missionary, and has been trying to break out ever since. He is totally gung-ho, and as an Outdoor Ed teacher, imperilled the lives of half the kids in Victoria. He's a great bloke though. He got me interested in Great Adventures in the outdoors. And me... I'm the bit that invents things that don't work, and skis off cliffs and camps on ants nests. Uncle Kev is absolutely fearless, incredibly well-meaning, and when it comes to ladies, very, very shy.